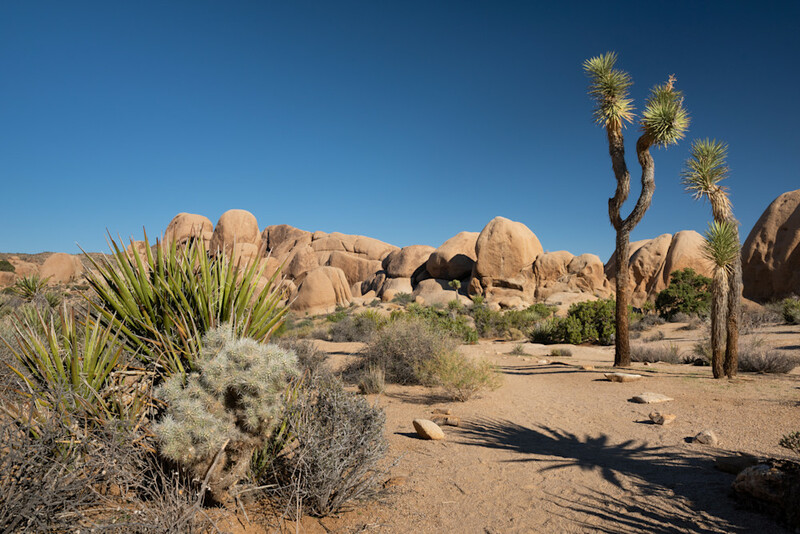 "Hiking in Joshua Tree National Park” Photograph for Sale as Fine Art. All images have a selection of Mediums of fine art papers, canvas, acrylic or metal in a variety of sizes. After the Medium selection, choose the Size of your art-piece to fit your needs and budget, and the finishing Style (for Canvas only - e.g. depth of canvas wrap & frame options). Preview your choice with our unique Wall Preview technology, Save to Favourites, or Email a Friend. Finally, click continue and Add to Cart when ready to make a purchase. Tip: Hover the artwork with the magnifying glass, or click on it to view in Lightbox mode / large screen mode. Thank You for taking the time to view this artwork! If you have any questions or are interested in obtaining an Image License for commercial use of this image, please don't hesitate to contact me. We use only certified archival materials for all our art reproductions. All our papers are free of optical brighteners and our inks are guaranteed to last a lifetime without fading or changing in colour. © 2019 Heather K Jones Photography. All Rights Reserved. We hate SPAM and will not share your email with anyone! Enter your email below to participate. The draw will take place at the end of each month. The winner will be notified by email.